Originally an award-winning play, Mouthpiece has a unique premise — the main character of the film is played by two different actresses at the same time. While the film’s narrative reads as somewhat fragmented and perhaps could have been tightened, some very pressing themes that are extremely relevant to contemporary female experience are articulated successfully throughout the story. After the sudden death of her mother, Cassandra is blindsided with grief. As she travels around the city making funeral preparations, she struggles to compose a eulogy that will encompass her mother’s personality and experience. 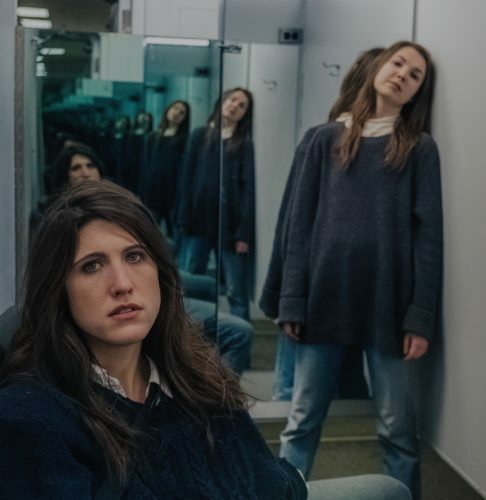 Cassandra’s two separate selves always exist simultaneously within the frame, and, while they are the same character, they each represent opposing sides of Cassandra’s personality. This functions as a visual metaphor for the dualism and conflict that woman experience in trying to express their creative identities. The choreography between the two actresses throughout the film is extremely effective and subtle, allowing for Mouthpiece to be both a unique thematic and visual experience.